Now, I show you how to display pop up menu in windows phone 7. and how can we handle it. for that you have to create a user control that is your pop up screen. and that is displayed in our home screen in windows phone. And this is the code behind of User Control as MyUserControl.xaml.cs. // Code that will fire when user clicks Yes button. // Code that will fire when user clicks Not Now button. So, Now open HomePage.xaml.cs for display pop up at specific location and you have to handle that pop up. This code helps you. And, yup its Done Easily...!! 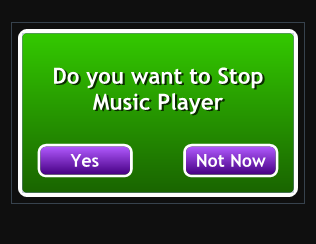 I think that's Good example for displaying the User Control as a Pop Up..! through this i can easily build the pop up menu. but i need the animation of Pop up Menu. then what can i do?? i am beginner in Windows phone. Use Story board for that Animation.